An interactive web mapping genealogical tool and a new Little Lake Cemetery Story Map which tells the story of the cemetery and some of the early residents of Peterborough is now available. Residents can explore the updated Little Lake Cemetery Guide and discover something new about their community by using the interactive historical timeline. The mapping application and Story Map can be found here and here. The interactive map allows users to explore more than 5,500 marked grave sites and provides information on the oldest name and date identified on the monument, a visual location, and a photograph of the marker. With the help of student interns supported by Young Canada Works, the map has been expanded and enhanced to include the location and information on more than 10,000 unmarked graves within the cemetery. With the updates, users now have the ability to submit additional information about interments. City of Peterborough geomatics/mapping staff, heritage preservation staff and Little Lake Cemetery collaborated on the mapping projects. The Story Map application is an interactive webpage that allows users to explore themes relating to the City’s first burial ground, the growth of garden cemeteries, the development of Little Lake Cemetery, and stories of some historical figures from Peterborough’s past. With nearly 30,000 burials in Little Lake Cemetery, the current map is not a complete record of interments at the cemetery. The City of Peterborough and Little Lake Cemetery foresee future projects will expand the numbers of graves recorded and the narratives presented on the story map. Peterborough Museum & Archives' newest exhibition titled Terry Fox: Running to the Heart of Canada is a must see for people of all ages. 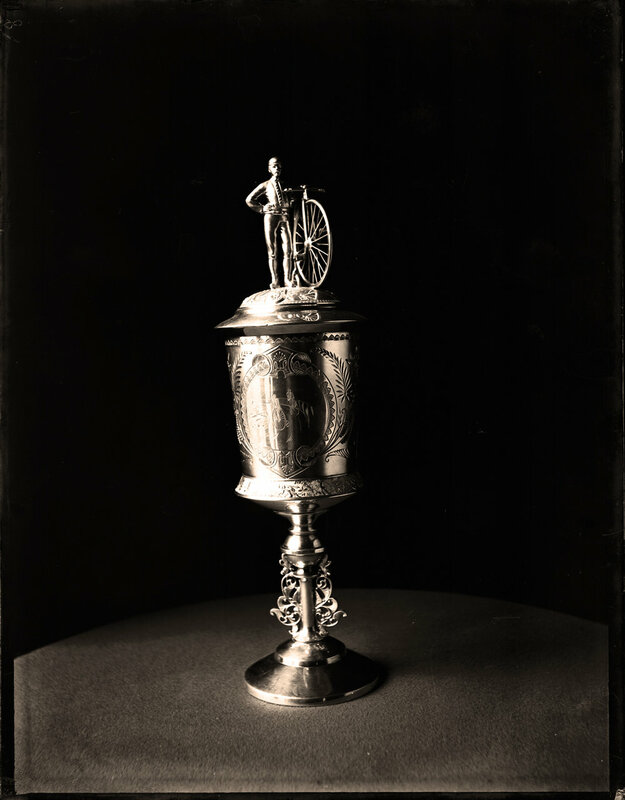 The exhibition is on loan from the Canadian Museum of History in Gatineau, Quebec, with support from the Terry Fox Foundation, and will be on-site in Peterborough for public viewing until Sunday, December 9th. The exhibition provides a unique look at Terry’s epic 143-day, 3,339-mile (5,373-kilometre) journey from St. John’s, Newfoundland, to Thunder Bay, Ontario in 1980. It explores Canadians’ deep and abiding affection for Terry and examines his unique place in our collective memory. Developed by the Canadian Museum of History in partnership with Terry Fox’s family, the exhibition traces Terry’s journey and shows the impact he had on modern Canadian life—the numerous schools, community centres and features of the landscape named for him, and the Canadian coins, stamps and passports bearing his image. “During the Marathon of Hope and the months that followed, Canadians filled our home in Port Coquitlam, B.C., with scrapbooks, written tributes and gifts reflecting a collective compassion and admiration for Terry's unselfish act,” says Darrell Fox, Terry’s brother. “More than 35 years later, it is time to share the Terry Fox collection and the compelling story that the memorabilia evoke with the world. The Canadian icon’s coast-to-coast journey in 1980 ended near Thunder Bay, when the cancer that had claimed his leg returned, forcing Terry to abandon the project. He died a national hero in June 1981, at the age of 22, having collected some $24 million. To date, more than $700 million has been raised in his name for cancer research. Terry Fox – Running to the Heart of Canada is being presented at The Peterborough Museum & Archives (300 Hunter Street East) from September 29th until December 9th. 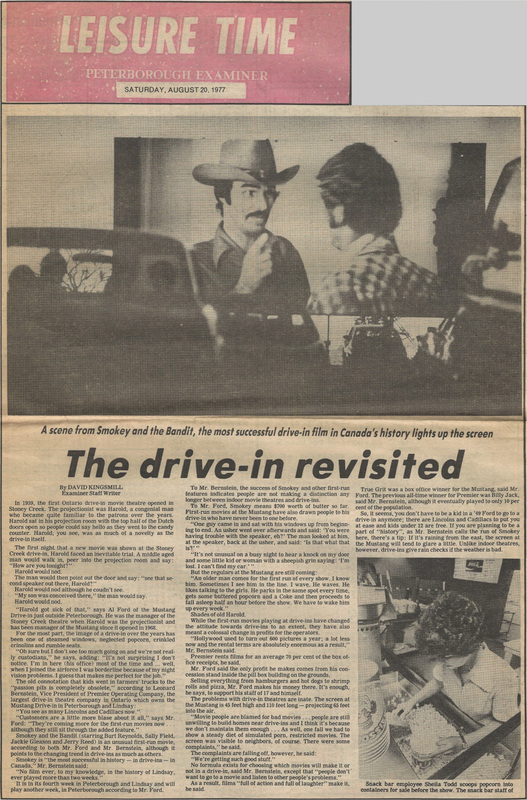 Amanda Ford reached out to us, saying she was inspired to write an article long in the making about the Mustang Drive-In after seeing a series of photos taken by Jay Callaghan published here on PTBOCanada in May 2014. 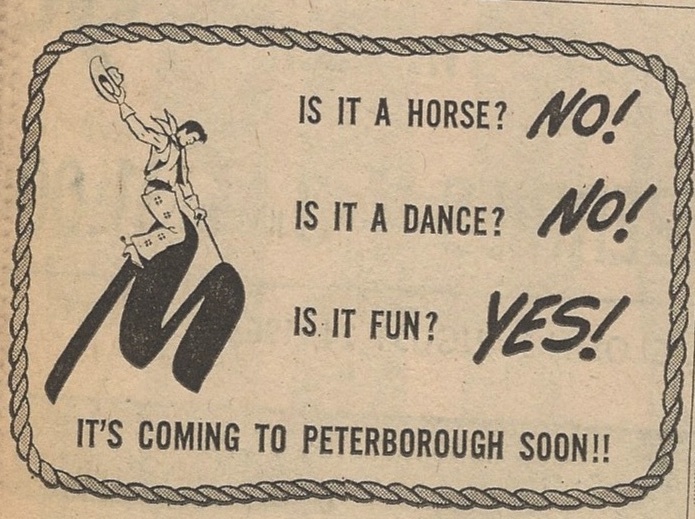 Fifty years ago this month in September 1968, the Mustang Drive-In Peterborough opened as one of the biggest drive-ins in Canada. I was eight years old and my dad, Alan D. Ford, was given the honour of being Manager of the Mustang Drive-In Peterborough. Born in 1920, he began his theatre career back in the 1940s after serving as a Flight Instructor with the RCAF during WWII. He worked in many types of theatres across Ontario and at other indoor movie theatres in Ontario. His dedication and experience earned him the position of Manager, Mustang Drive-In Peterborough. My dad was was the manager there from 1968 until his retirement from the theatre business in 1986. The Mustang Drive-In was to be the flagship Drive-In for GTI Drive-In Services Limited. It boasted a 775 car capacity and was one of the largest screens in Canada. The Peterborough Examiner wrote about the venture in a 1968 article..
All dressed up for the Grand Opening: The snack bar (pictured below) was originally set up with two sides serving the same item, with a cashier for both lines. This would help move the line along during the busy peak times. Standard uniform for the girls working in the snack bar: Don’t forget your cowboy hats ladies! Manager Al Ford (aka my dad) only had one rule: Always change into your street clothes when your shift was over. “I don’t want to see girls in uniform climbing in the back of cars with boys!” he would say. When we weren’t busy with work duties, my brother and I would sit upstairs in our family apartment above the snack bar, and watch Smokey and The Bandit without the internal speaker on. (My family lived onsite above the snack bar and beside the projection room, and dad had them wire a speaker that sat behind his chair in our living room so whenever we wanted to watch the movie we could just turn the speaker on to hear the movie.) After eight weeks, we had the dialogue to Smokey down pretty good and would act out the scenes ourselves! My father passed away in January 1991, and my mother Donna still lives in Peterborough. I live in Courtice now, and my sister Debbie lives in Bowmanville and my brother Bob in Omeeme. The Mustang Drive-In Peterborough was sold in the late ‘80s to an independent business owner. I believe it changed hands one or two more times until the last owner was forced to close when the cost of switching to digital projection was too much. The City of Peterborough Geomatics/Mapping Division, the Heritage Preservation Office and Little Lake Cemetery Co. announced on Tuesday (February 6th) the re-launch of an Interactive Web Mapping Genealogy tool highlighting the history of Little Lake Cemetery. Created in conjunction with students from Fleming College’s Geographic Information Systems program, monuments and markers from the mid-1800’s to 2000 have been identified, photographed and mapped for the public interest. Users can search the grave marker inventory by surname and/or death date. The search results include records containing family names, the oldest date on the monument and an image of the marker. At any point, the user can freely search the map and click on any grave marker to view corresponding information. It is recognized that this is not a complete record of interments at the cemetery, but is limited in scope to the task assigned to the students at time of the project. It is the hope of the City of Peterborough and Little Lake Cemetery that future projects will be able to expand and enhance this valuable history tool, building towards a more encompassing historical record of the residents interred and the commemorative artifacts that reside at the cemetery. Little Lake Cemetery, established in 1850, is a not-for-profit public trust owned by all who have purchased plots at the cemetery. It is governed by a volunteer board of directors and a professional staff. 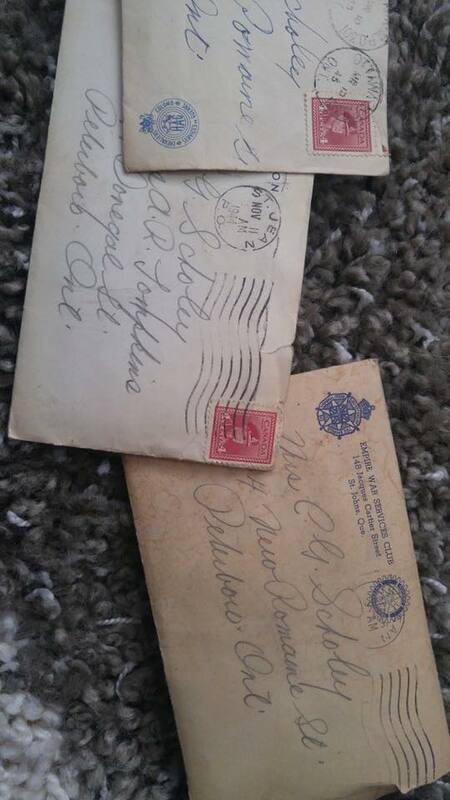 Ever noticed the spelling "Peterboro" and "Peterboro'" on old postcards and letters and such? We reached out to local historian Elwood Jones at Trent Valley Archives, who tells PTBOCanada the spelling has offically been Peterborough since 1825, though there was some ambiguity after that. "Newspapers sometimes used the shorter spelling, particularly in the period from the 1880s to the 1910s. Also, the railways preferred the shorter form on timetables and the signs when approaching the city limits or railway station." Jones collaborated with Healther Aiton Landry at Trent Valley Archives to provide this sampling below to PTBOCanada of how the spellings were often used interchangeably over the decades. 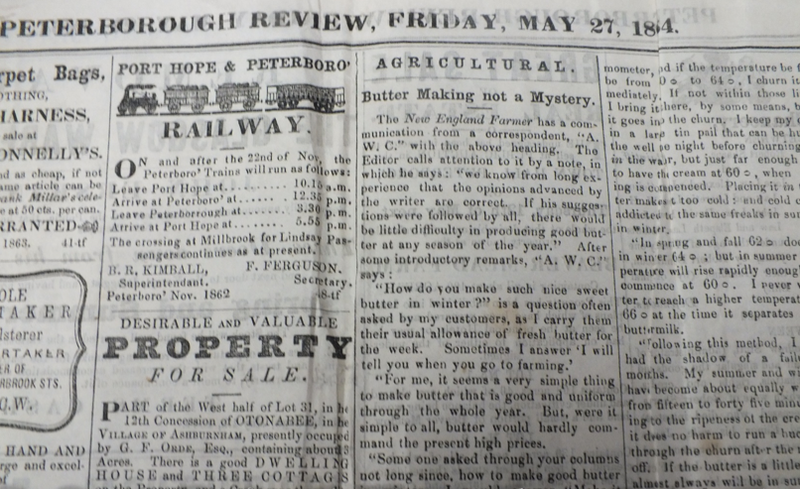 The mixed use of Peterborough and Peterboro in 1863 is caught in the 1863 Peterborough Examiner below. The Port Hope and Peterborough Railway posted the times for trains to and from Peterboro. The American Hotel is in Peterborough, but the small ads (all on the front page then) give their address as Peterboro or Peterborough. Still in the 1860s, notice Port Hope & Peterboro’ Railway with the apostrophe added below. The newspaper, on the other hand, was sticking to the proper spelling of the time, "Peterborough". Also, check out The Peterboro’ Review below and notice the mixed uses in the column to the left of the Review ad. Confusing, yes! Curiously, Peterborough is used in the title for this postcard circa 1905, and for the Roy Studio logo, but the spelling on the train station is PETERBORO. However, in this postcard below, Roy is signing as from Peterboro (see far left), and the Lift Lock is described as being in Peterboro (far right). The newspapers and postcards in this post are from collections at the Trent Valley Archives. The long and the short: Next time you spell Peterborough "Peterboro", just tell your friends you're going all old school cool. Remember the old Hi Tops Chinese restaurant that was a fixture in downtown Peterborough? You couldn't miss the iconic sign when you were driving down George Street and at night, it was even more of a focal point with its neon lights. When the sign came down in 2013 after it was announced Hi Tops was closing after about 100 years in business, everyone wondered what would become of it. Surely this rich part of Peterborough's history wouldn't end up in landfill. When The Spill owner Dave Tobey closed the establishment last fall, people were wondering again, What would now become of the Hi Tops sign? Would it be saved again? Indeed it would, thanks to another downtown business owner: "When I heard The Spill was closing, I reached out to Dave Tobey about the sign and he put me in touch with Bill Kimball the caretaker of the sign," Hot Belly Mama's owner Travis Smith tells PTBOCanada. "I said I would be happy to display it at The Belly as it would definitely fit in with my atmosphere there. He agreed." "I feel like the sign is a piece that needs to be on display as a big part of Peterborough's history," Smith tells PTBOCanada, adding that this whole process of getting the sign and installing it came together over the past couple months with Kimball and an amazing group of people in town. Kudos to Smith for showcasing this important piece of Peterborough history in his restaurant. Go check it out next time you're in! What began on August 26th, 1954 in Peterborough ends this Sunday (January 14th), as Sears closes for good in town. Sears had an amazing 64 year run here, and everyone knows someone who worked there or shopped there at one time. And who could forget the excitement of receiving the Sears Catalogue and Sears Wish Book in the mail. The Sears location in Peterborough is among the last locations to close across Canada, marking the end of the official end of the chain’s historic retail reign in the country. Share your fond memories of Sears Peterborough on our Facebook page. Outboard Marine, which once employed about 2,000 employees in Peterborough before closing in the Nineties, was famous for, among many other things, producing Johnson and Evinrude engines. Some of those were on display on Saturday (September 16th) on the shores of Little Lake at a classic boat display. 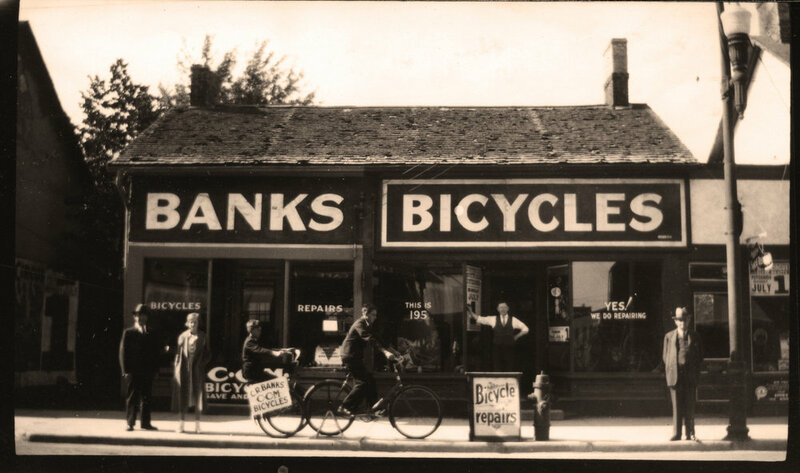 George was featured (see below, bottom left) in an old dealer publicaton called Pioneer Chips. Many of our readers may recall these classic old designs, and perhaps might even be using these motors now. "To see my Dad's designs still around and being cherished after decades is incredible to witness," Aaron says. "It's neat to see they live on." Everywhere you go, there always seems to be a connection back to Peterborough—from people who once lived here, to our Sister City, to travelling in Northern Ontario. When travelling along Highway 17 about an hour East of the Manitoba border, you will see a sign alerting you of the time change depending on the direction you are travelling. 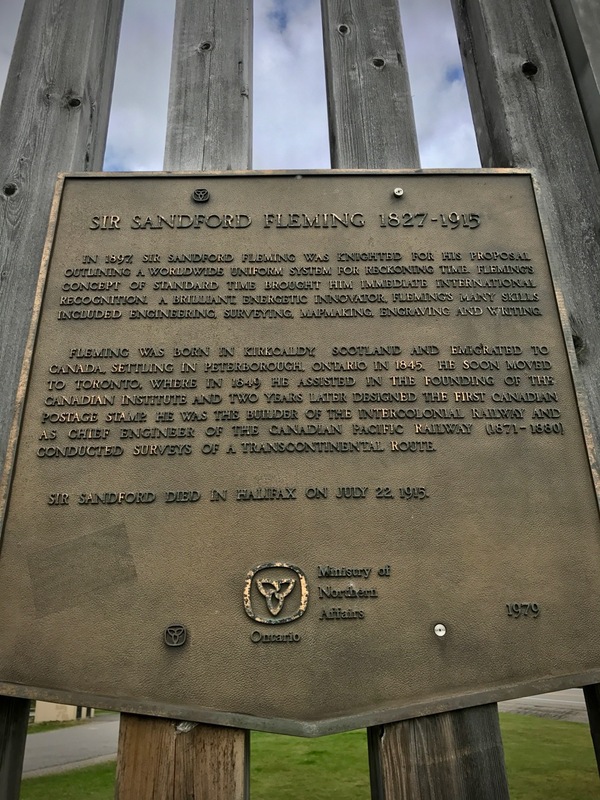 The imaginary line that separates Eastern Standard Time and Central Standard Time was created by Sir Sandford Fleming, who had great ties to Peterborough (see No. 18 here in our "Fun Facts about Peterborough"). There are two markers commemorating his work and even mention Peterborough by name.